Ask for the Mason County Health Department! A long history of quality care: Senior Home Care is a concept that is gaining new popularity with seniors and family caregivers. New senior home care agencies are springing up all over the nation, offering a wide variety of healthcare and personal care service agencies. Here at Mason County Health Department we have been providing quality homecare to our clients for over twenty years. By Choosing Mason County Health Department to provide your homecare aide, you will have the reassurance that your loved one is being cared for by a dedicated, local agency. We value the concept of Aging in Place. Keeping your loved ones in their homes will allow them to age with dignity and grace. Our homecare aides provide personal services, helping with daily activities such as bathing, dressing, general housekeeping and transportation. Homecare is a popular and viable way to help take care of a senior parent in their own home when adult caregiver children cannot be there or just to help out. 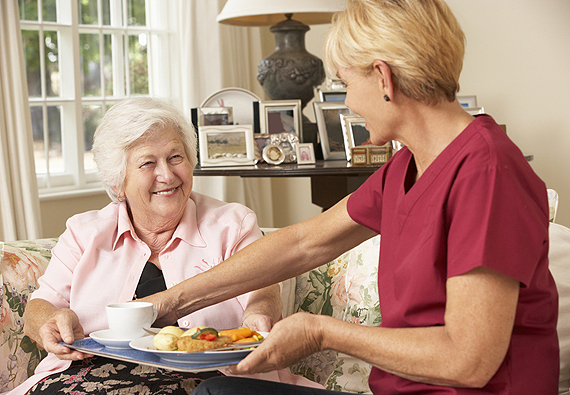 We have trained Homecare Aides to give you the assistance needed to care for your loved one in their homes. Our homecare aides received 24 hours of pre-service training, a criminal background check, and quarterly in-service trainings to ensure quality care is received. Supervisors monitor the care your family members are receiving so that you don’t have to. Finding a senior home care agency can be a tricky thing to do, especially when you are far away and don’t know where to start. Let our website be a guide to getting this valuable service started. Available Programs offered through Mason County Health Department Senior Care include The Community Care Program and Private Pay Program. What is the Community Care Program? The Community Care Program (CCP) is a state program created in 1979 by Public Act 81-202 for the prevention of premature and unnecessary institutionalization of seniors by providing in-home and community based services. CCP is managed by the Illinois Department on Aging (IDoA) and is recognized as a national model of in-home and community based care to at-risk seniors. In Fiscal Year (FY) 2002, the program served approximately 40,000 frail older adults with overall expenditures approximating $220 million. Funding for CCP comes through the State General Revenue funds as well as through a Federal Medicaid Waiver and in some cases a client co-pay portion exists. The Program saves state tax dollars each year through the avoidance of unnecessary and premature placement of clients into nursing homes or other more costly alternatives.